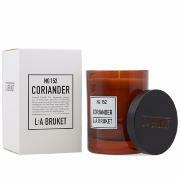 L:A BRUKET scented candles are made of wax from organic soy, hand poured into mouth blown glasses by skilled craftsmen. The rich scent and the glass design brings a wonderful ambience to any room. Some of the candles will boost your energy levels when you are feeling tired and weary, while others will help you relax and unwind. The delectable aroma of Citrus aurantium paradisii has a pronounced impact on senses and emotions. It is refreshing as well as euphoria-inducing and energizing. 1. Remember that it is better to leave the candles lit little time rather than a whole evening so that their fragrance is more intense and last longer. 2. Cut the wick to 0.5 or 1 cm in length before lighting it to limit the emission of soot. 3. If you are concerned that the surface on which you have placed the spark plug is damaged, place the lid under the glass to protect it from the heat of the spark plug if it is completely consumed. 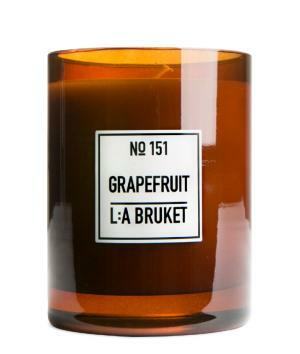 Keep the glass because L:A Bruket candles are refillables. Inspired by a way of life closely linked to nature, L:A Bruket draws from its Swedish origins a complete lifestyle, centered on respect for the environment and the skin.Inspirée d'un mode de vie étroitement lié à la nature, L:A Bruket tire de ses origines suédoises un art de vivre complet, centré sur le respect de l'environnement et de la peau. L: A Bruket uses medicinal plants, essential oils and raw ingredients, both from land and sea, and tries to keep them as natural and environmentally friendly as possible. L:A Bruket rejects the idea that nature is a force that must be dominated or would be foreign to our modern age. Vildros (wild rose): Refreshing. Wild rose oil, rich in nourishing active ingredients. Stimulates cell renewal of the skin. Lemongrass : Essential oils of lemongrass and rosemary have a purifying, stimulating and bacteriostatic effect. Bergamot Patchouli: Bergamot soothes, refreshes and has a slightly exfoliating effect. Patchouli is a plant with soothing, purifying, astringent and healing properties. Sage, Rosemary, Lavender: Essential oils of sage, rosemary and lavender with balancing and soothing virtues. Coriander & Black pepper: Coriander seed oil is one of the very first medicinal aromatic plants to have been used for its stimulating, relaxing and heating effects. It also has bacteriostatic properties. The oil of black peppercorns relieves the muscular contractions thanks to its heating and stimulating properties. Gurkmynta (Cucumber Mint): Cucumber and mint have refreshing and astringent properties. Eucalyptus Marjoram: The essential oil of eucalyptus leaves has refreshing, stimulating, cicatrizing and bacteriostatic properties. Marjoram leaf oil is an antioxidant that stimulates and warms but is also a recognized antiseptic. Dark Vanilla (Vanilla &Patchouli) : Patchouli is a plant with soothing, purifying, astringent and healing properties. Geranium (Geranium, Lavender, Black pepper) : The essential oils stimulates and cleans, warms and soothes as well as acts antibacterial and anti-inflammatory.